The touch-style U.are.U 5160 Fingerprint Reader is a FIPS 201 PIV certified, optical fingerprint sensor designed to serve as a USB peripheral. 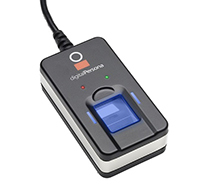 This ruggedized, powerful fingerprint verification and identity machine are ideal for large deployments in voting, entitlement, healthcare, finance, and education. The reader is IP64 rated and sealed against dust and liquids. The onboard electronics automatically control calibration and data transfer over the USB interface. The U.are.U 5160 Reader is designed to meet and exceed the FIPS 201 Personal Identity Verification (PIV) Image Quality Specification, a key industry standard. It produces 500 and 1000 dot-per-inch (dpi) fingerprint images in ANSI an ISO/IEC standard formats. The U.are.U 5160 Reader can be used with any standards-compatible fingerprint templates extractor or matcher, including the DigitalPersona® FingerJet™ Biometric Engine, VeriFinger and MegaMatcher Standard and Extended SDK’s.